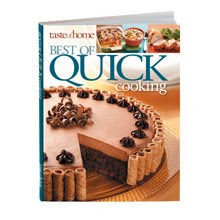 Taste of Home is clearing out their warehouse and has greatly discounted 18 different hardback cookbooks! Some of these cookbooks were originally priced at $24.95 and have now been discounted to just $5 each! Check out all the $5 cookbooks here! You can also score FREE shipping on an order of $10 or more— just use promo code 347! Make sure to purchase 2 cookbooks and you’ll score FREE shipping! Also, don’t forget to go thru Shop At Home! You’ll get 10% Cash back from your Taste of Home purchases-That's Right! 10% cash back! Get 150,000+ free online coupon codes, printable grocery coupons, restaurant coupons and more at ShopAtHome.com! Just login or register at Shop At Home, then in the search box type in Taste of Home. Last time these books were available they sold out super fast, so hurry if you want to snag a few. Wow, you are on fire. Thank you for sharing.